Forget the "Edge of Glory," this time Lady Gaga has gone way over the edge. At a concert in Sydney on Wednesday, Lady Gaga rolled out (literally) for a jaw-dropping performance. But fans weren't wide-eyed because of Mother Monster's epic lyrics or awkwardly awesome dance moves. 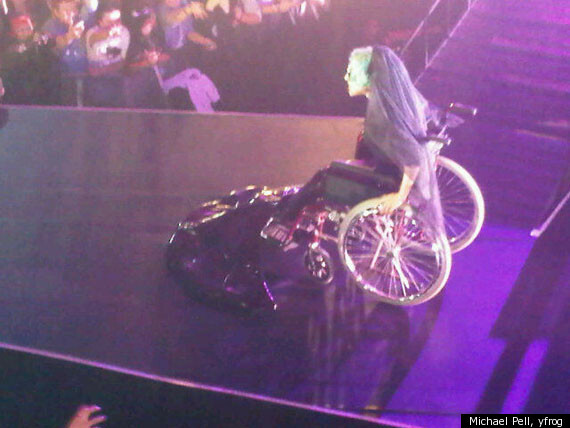 No, fans were scraping their chins off the floor for quite a different reason -- Gaga took the stage in a wheelchair. Sure, Lady Gaga hasn't risen to global superstar status for playing it safe, but did Gaga's latest stunt go a little too far? According to fans, it did. After her performance, while leaving a Sydney club, Gaga and her entourage were egged by fans who thought her disability bit was offensive rather than outrageous, according to the UK's Metro Online. Although Gaga wasn't directly hit with any of the eggs, her posse wasn't so lucky. But this isn't the first time the "Born This Way" singer has referenced wheelchair disabilities in her concerts or music videos. At the 2009 MTV Video Music Awards, Gaga hired an able-bodied dancer to join her "Paparazzi" routine -- only catch, the dancer would be performing in a decked-out wheelchair. Gaga once again rolled out in a wheelchair in her "Paparazzi" video after being pushed over a railing by video boyfriend, Alexander Skarsgard. Leave it to Gaga to make things come full circle for us. First she hatched from an egg at the 2011 VMAs and now she's the target of the same food group.